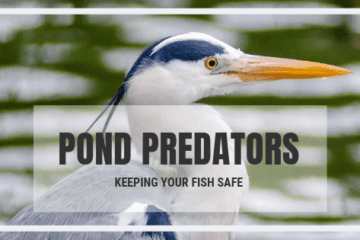 When I first went into the local pond outlet, walking past the registers and the racks of fish food and various pond products, I heard a sound that got my attention. The sound of rushing water was filling the room I was in. It was coming from the back if the store. I walked through the opening, and out into a display area filled ponds of all different sizes. These were impressive displays each surrounded with magnificent plantings. The sound that had gotten my attention was coming from the back of the display area. As I made my way to the back of the store… there it was! The source of the sound. It was a waterfall display that drained into a large, deep pond filled with slow moving magnificent creatures. I was mesmerized by their beauty and grace as they slowly flowed about. It was from that moment on that I knew I HAD to have that. These particular Koi were full-grown, approximately 26 inches in length. I counted 9 of them as they gracefully made their way around the natural pool. I was totally hooked! My only remedy would be to create this in my own backyard to enjoy on a daily basis. Once you have made a decision to keep Koi, there are some things you need to keep in mind. The habitat necessary for keeping Koi can be a challenge depending on how fully stocked the pond will be. 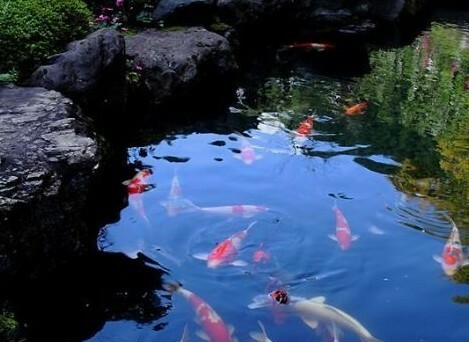 Some suggest that a pond or fountain needs to be a minimum of 1000 gallons in order to keep Koi. This is the bare minimum! I don’t think this is large enough to house one of these magnificent creatures. Because of their size Koi require a habitat that allows them to swim, not only horizontally, but vertically as well. They need exercise just as we do. In order for that, their pond or tank should allow them to swim up and down. If a koi reaches say 26 inches in length, then his habitat should be twice as deep as his length to allow for proper exercise. It is a great misconception that Koi will grow to the size of the tank or enclosure. Koi will grow to the size of that particular type. It would be an injustice to the fish if it were kept in a pond and barely had enough room to turn around. Although these are hardy fish, in order for them to thrive they generally require extensive filter systems to keep the water clean and clear. 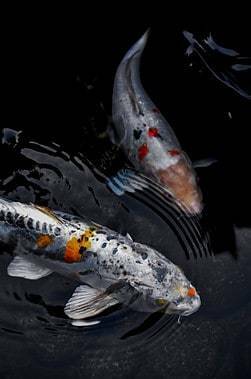 The reason there is such an emphasis on water quality is because the Koi that we enjoy today are a result of generations and generations of inbreeding in order to achieve the desired color and scale pattern. As a result, the colorful Koi we see today have a weakened immune system. 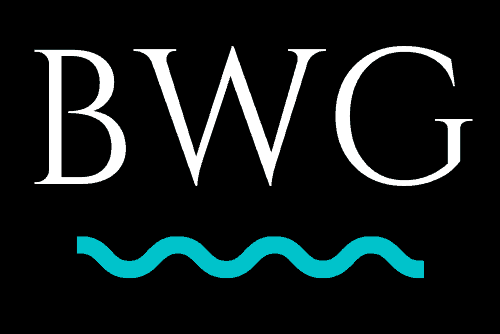 This makes water quality a number one concern to keep these fish healthy and thriving. 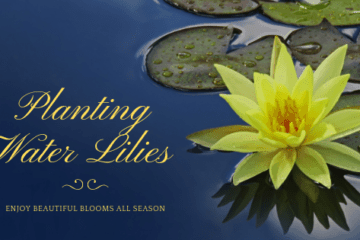 If your focus is to keep koi, then it is a good idea to include a bottom drain in your pond. This will help in the collection of fish waste and for proper water circulation. Another recommendation to maintain a high quality of water is the flow of the water. 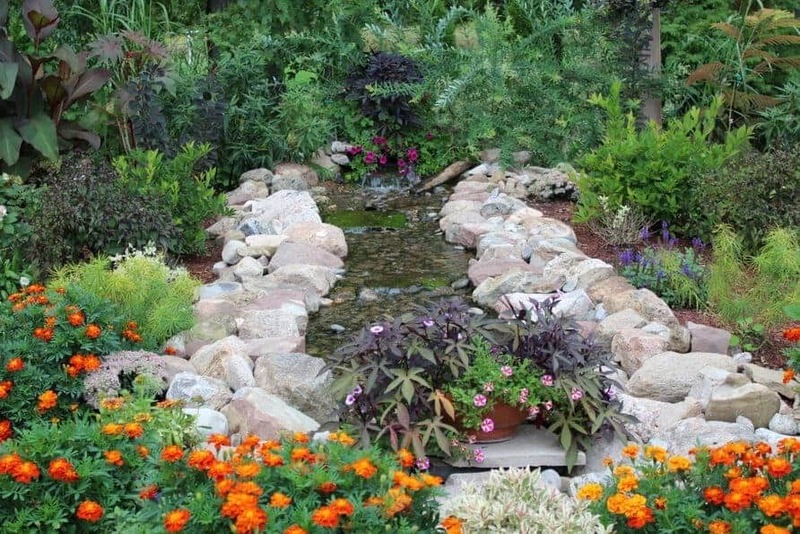 Instead of a typical skimmer box/waterfall setup, it is recommended to have more than one outlet for the filtered water to flow back into the pond. By doing this it creates a swirling effect that forces debris to the bottom drain, while the skimmer box takes care of any floating debris. This is the best way to keep the water quality high. 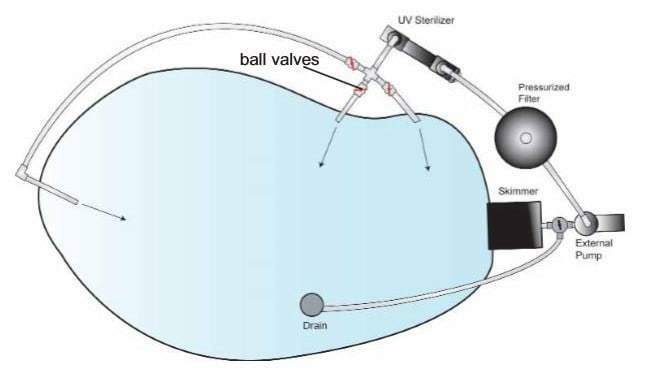 Below is a diagram of a typical setup. This is from the instruction manual of the UV light featured here. A UV light is also an essential part in keeping water quality high. Koi, just like most other pets you keep can be trained. It is possible to train your fish to be hand fed. There is nothing like the bonding experience you get from have your Koi come to the surface and eat out of the palm of your hand. Koi are omnivores which means they will eat just about anything. In order to keep your fish healthy, it’s important to feed them a balanced diet. Just like people, Koi need proteins, fats, carbs, fiber, vitamins, and minerals. When deciding on what food to give your Koi, choose one that provides balanced nutrition. There are many types of koi food products on the market. Some float, some sink. I prefer the food that floats on the water. This allows you to enjoy your koi at feeding time and make sure they eat all that you give them. Uneaten food may sink to the bottom and cause excess waste, which is another reason I prefer the foo that floats. If you would like to enhance their color, look for food that contains plankton, shrimp meal, marigold petals, and spirulina. These ingredients will bring out the natural colors in your fish. The ingredient that will have the largest effect is spirulina. This ingredient is known to turn the yellow into a rich gold, and orange deeper richer orange, and the red even deeper red. It is an all-round color boost! Koi have traditionally symbolized wealth, success, and good fortune, along with determination and persistence. The typical Japanese koi, actually originated in China. Chinese ledgend has it that Koi swam up the waterfall and through the dragon gate where they were transformed into a dragon. This story sybolizes many great traits such as independence. The Koi went against the flow of the waterfall to reach its desired goal. the fact that the Koi swam up the waterfall is where the idea that Koi is a symbol of strength originated. Koi carp were kept in Chinese rice fields in the 17th century as a food source. Hardy Carp are very resilient and easy to keep making them ideal to keep in the rice fields. These fish are so hardy that they are found all over the world, surviving in all types of climates. The Japanese Koi that we know today are actually ancestors of those carp from China. In the wild carp are naturally brown. Eventually the practice of keeping Koi carp as a food source spread to Japan. The Japanese noticed slight color variations in some carp. Using selective breeding techniques the Japanese have brought about the amazing color variations that we see today. 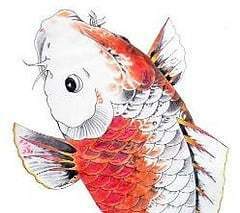 So in essence the Japanese Koi we see today are merely mutated carp that origtinated in China. This is a topic that is more expansive than I would like to get into in this article. That being said I will just point out some basic points of the breeding process. Koi typically become sexually active when they are around three to four years old. 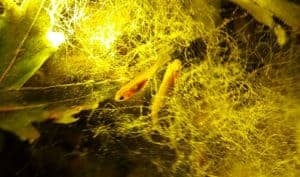 Typically, Koi will mate and produce offspring all the way up to age 15. The water temperature needs to reach 60 – 70 degrees F. Mating takes place during late spring or early summer. If your purpose it to breed Koi, you will need more specialized equipment for keeping the water optimal. You will also need multiple tanks to separate the mating couples. 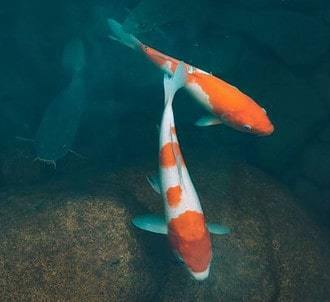 Koi like to have their privacy during the mating cycle. It is also important to provide them with a fry mate to encourage them to lay their eggs with confidence. The fry must then be protected after hatching. Not just from predators, but also from getting sucked up into the filtration system. This can be accomplished with the use of fine netting. Throughout history Koi have been a symbol of prosperity and success, and I can see why. Since my first encounter with these magnificent animals I was hooked. I knew what I wanted. Their beautiful colors and graceful movement is mesmerizing. People are passionate about their Koi ponds. The problem with Koi is once you get the fever, the obsession will continue to grow! I would love to hear what you think about keeping these enchanting creatures. Do you have any experience with the keeping these wonderful fish? How about any added advice you would like to pass on to others? Thank you for reading, please leave any comments below and I will get back to you as soon as possible. Very interesting post! And I never knew you could enhance the color of your Koi by feeding them certain food that has pigmentation, very cool! I wonder how these fish do in colder weather, or if you live in a place that gets snow in winter..
Actually Koi fair well in winter with the right setup. As long as the ice on the surface of the water doesn’t freeze over solid. This traps poisonous gases in the water. Once the water temperature drops below 40 degrees F, they no longer need to feed. Their metabolism slows to a crawl during the winter months allowing them to survive. Wow. 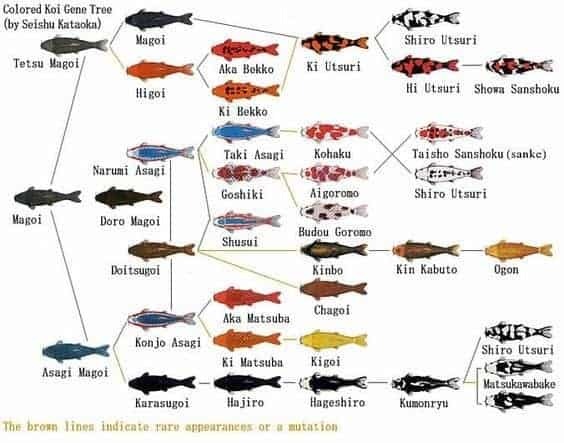 I didn’t know that koi had selective breeding patterns. They’re so beautiful it is almost difficult to believe they were bred for food, but that makes sense. The Koi that were bred for food were not the colorful fish we see today. They were plain brown. The Japanese saw the potential in the fish and brought about the beautiful color variations we see today. Wow! There’s a lot to know about keeping and maintaining Koi and there custom made habitat. They really grow to be a pretty decent size too. The video of hand feeding them, shows the guy feeding them with pretty large handfuls of food, this must be costly feeding them after a while. I guess with wanting any pet, it can be costly. My husband has a Koi pond and currently only has 3 small Koi. I think he may want to purchase more, is there a such thing as too many fish for a pond? Especially, considering the size potential that Koi will grow. It is possible to overstock your pond. This can be mitigated by increasing the efficiency of your water filtering system. The important thing is to be sure your pond is large enough for the Koi to swim up and down, in other words it should be at least twice as deep as the potential size of the Koi. These amazing creatures are addictive, and once you get some, you just want more!